FORMER WORKERS AT Clerys department store in Dublin city centre are to get a financial settlement, almost two years after it unexpectedly shut down in controversial circumstances. The settlement was reached as part of a deal between the Justice for the Clerys Workers Campaign and Natrium, which bought the former department store. As part of the deal, Siptu has dropped its appeal against planning permission for the Clerys building. This means that the proposed multi-million redevelopment of the Clerys building into a multi-use retail, hotel and restaurant until will go ahead. 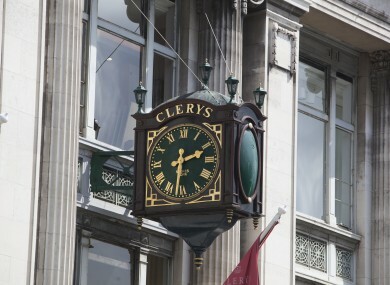 About 130 direct employees and another 330 who sold their wares in the department store through concessions lost their jobs when Clerys was suddenly declared insolvent in June 2015. The subsequent liquidation has become infamous due to the cold treatment of the staff, many of whom had worked at the store for decades. On top of the ill-treatment of workers, the State ended up having to foot the bill for redundancies. The exact details of the new settlement for the former Clerys workers have not been made public. However, it includes a “significant” goodwill payment to the former Clerys staff, as well as a number of other provisions relating to the building and the north inner city community. The campaign said they were happy with the settlement. Speaking today in the Mansion House, Dublin Lord mayor Brendan Carr said that the announcement of an agreement between both sides “closed a period of strife” in the city’s history. Carr also charted the important role Clerys had played in the history of the city. “Following the agreement… I hope that future lord mayors will never have to pass a vacant Clerys building on St PAtrick’s Day again,” he said. Deirdre Foley of Natrium – the company which controls the the Clerys building – also spoke in the mansion House today. She said her company was looking forward to proceeding with the development of the building, which she said will take about three years. When questioned about whether she had any comment to make in relation to the treatment of the ex-Clery workers, Foley said she was “not here today to talk about the past”. Ethel Buckley of Siptu described the deal as “the beginning of a new era of mutually beneficial cooperation between Dublin City Council, community organisations, trade unions and business”. The redevelopment of the Clerys building, which dates back to 1853, will see a hotel, shops, office space and restaurants opened on the site. Email “Clerys workers are going to get a settlement, almost two years after the department store shut down”. Feedback on “Clerys workers are going to get a settlement, almost two years after the department store shut down”.